Morning everyone! 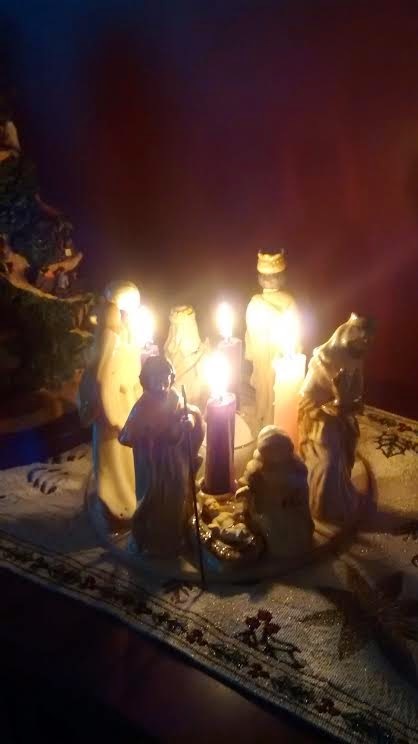 As you can see from my photo (sort of, sorry for the bad lighting via the camera on my phone :0), all of our candles are lit, and Christmas is this week. Terribly exciting, yes? I'll be honest though (which I tend to be on this blog, that's part of why I love it so much and have kept writing all these years), my weekend was a bit stressful. I'm experiencing the Advent blues it seems, but I remember going through this during Lent this past year as well. As soon as the Easter Vigil hit though - :0. Everything was great. I'm hoping that will happen with Christmas too. I'm trying, I really am. I will say that a highlight was Mass yesterday for the Fourth Sunday of Advent. I got the kids all packed up with promises that all four candles would be lit, and off we went. The instant we got to the pew, Anne announced that she had to use the restroom, complete with desperate grabbing of requisite body part. I took her back and she expressed interest in once again joining the other kids for Children's Liturgy of the Word. I told her that was fine, but that she had to be a very good girl and listen and follow directions via the nice lady leading the group. She agreed. The Liturgy of the Word hadn't started yet, so I explained that she'd have to process up to the altar with the other kids, which would be new for her. When the time came, she seemed a tad uncertain, but I encouraged her to follow another little girl who appeared in the aisle near our pew. She did, and then looked like she had been doing this for years, eagerly listening to Fr. Jay as he gave them instructions at the altar and then scampering back into the sacristy with the group. My baby, where has the time gone? Henry, meanwhile, was beside me, being super attentive and good. We've come a long way from The Incident, my friends. And it is *so nice* to be able to listen to the homily without shenanigans to referee. I could actually *hear* what Fr. Jay was saying, which related to Mary's absolute trust in the Father's plan for her when the Angel Gabriel came to make this dramatic request. When it came time for the collection, I could see Henry watching the door to the sacristy, as was I, to be vigilant for Anne's safe return. She came dashing out, full of enthusiasm, and bearing an activity sheet relating to the day's Gospel. Though active for the rest of Mass, she was very well-behaved, coloring on her activity sheet and asking to hold my small bag of chaplets, which she lines up carefully on the pew each week. 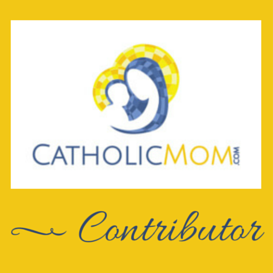 "You have the most well-behaved children at Mass. You must be so proud of them." I just about teared up. My children have been *ill behaved* at Mass many times. MANY, MANY times. But on the whole, they are good, and that was such a nice thing to hear. On a day when I really need a pick-me-up, I was ever so grateful for that comment. And I so appreciated that they took the time out to say something nice to me. Often, when it comes to children in church, you hear nothing unless someone deems it "necessary" to criticize you or your children. This was so refreshing. And so, a lovely final Sunday in Advent. As a family, we will attend the Christmas Eve vigil Mass at 4pm. I have always wanted to go to Midnight Mass, but with the kids the ages they are right now, it's definitely not happening for some time. :) And next Sunday is the feast of the Holy Family, I always love that day! And then the feast of Mary, Mother of God. Sublime. We've named him Sven. 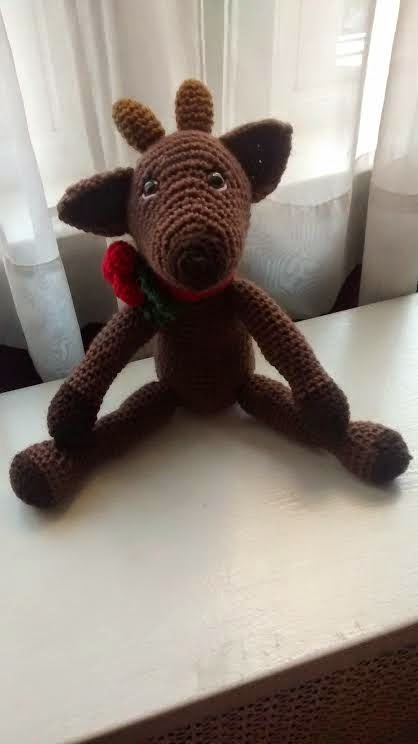 :0 He was presented to my Secret Santa assignee, Alix, and I just loved crocheting him for her. Precious! I received a homemade loaf of banana chocolate chip bread and a gift card to buy books or supplies from my Santa. Thrilled! I am very lucky to be a member of such a talented and generous group. All right everyone, how was your Fourth Sunday of Advent? Do detail in the comments. And tomorrow I have a book review for you, of Catholic historical fiction set in the late Nineteenth Century. Intrigued? Head on back tomorrow. :) See you then!